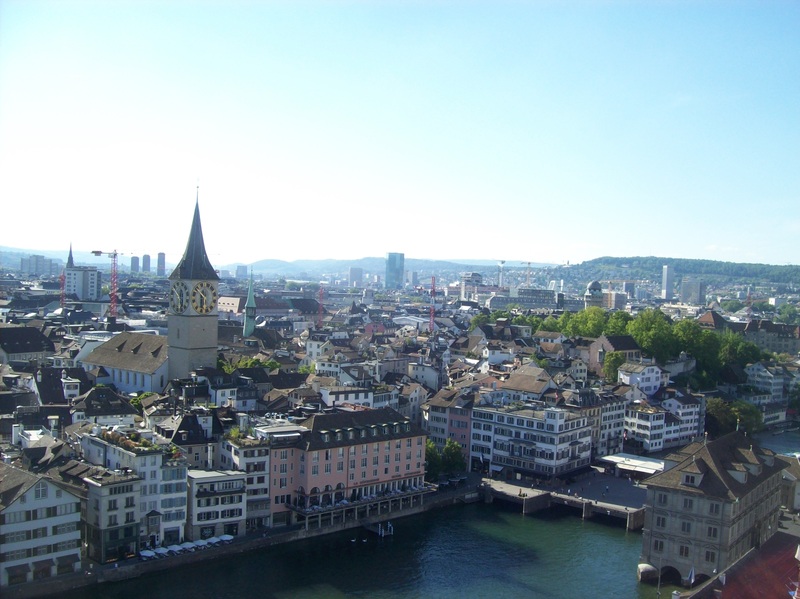 I recently had the opportunity to travel to Germany and Switzerland with a group from Anderson University. After an incredible trip, I have enjoyed sharing about my experience with people back in the U.S. over the last few days. Below is the journal I kept throughout the trip, chronicling our activities from each day, along with some of the pictures I took along the way. May 14-15 really just felt like one really long day with a nap. After starting May 14 in an Anderson hotel after graduating the previous day, my parents and I went to Atlanta for my 10:15 pm flight from Hartsfield-Jackson. I started the flight from Atlanta to London by watching the flight tracker on the in-flight entertainment screen. I know flying is very fast, but I got a tangible example as we crossed South Carolina (from just south of Anderson to around Rock Hill) in about 15 minutes. I didn’t sleep much while watching some of the in-flight entertainment, and actually dozed off on approach to London Heathrow and was woken up by the feeling of the landing. I slept for most of the London-to-Berlin flight, which was roughly an hour and a half. Leaving the airport in Berlin, our group had an interesting moment when not everyone got on the same bus, and one group—the one I was in—had neither professor. Through cell phones, we figured out where to get off the bus. Our hotel is nice, and very close to the city center, and most of our attractions for the next couple of days are within walking distance. Dr. Duncan told us it was built for when the World Cup was here (2006). After dinner tonight, we walked back to the hotel, passing the Brandenburg Gate and Reichstag, among other notable landmarks. These old structures lit up at night is really cool. Our first full day in Berlin was a full day, for sure. We began with a guided tour of the Berlin Wall Memorial. There stands one of the only sections left of the wall itself, plus vertical steel beams marking more of where the wall stood. I never realized 139 people were killed as a result of the Berlin Wall. There is also a chapel there where a church once stood that was torn down during the Wall era, and the outline of the church foundation is still there. Behind the chapel, we walked through a cemetery, where all the graves are from since 1985 except the ones that have been restored. At the Berlin Wall gift shop, they sell pieces of the wall for a remarkably cheap price: 4,50 Euros for a piece of history. I guess they’re that cheap only because there’s a lot of pieces, since the wall was around 100 miles long. After the wall and lunch, we walked by Reichstag and the Brandenburg Gate in daylight, then walked to the Holocaust Museum. It was an interesting juxtaposition to have World War II (Holocaust) and the after effects of it (Berlin Wall) back-to-back. Germany has certainly not hidden its worst history, and does quite a job of preserving it. In the Holocaust Museum, there are displays of letters and diary excerpts from Holocaust victims, and the stories of numerous families, all of which had none or few survivors. This really humanized the tragedy; it is often a challenge finding individual stories when appr. 6 million Jews (and up to 11 million altogether) were killed. Just a couple blocks from there, ironically, is Hitler’s Fuhrerbunker. 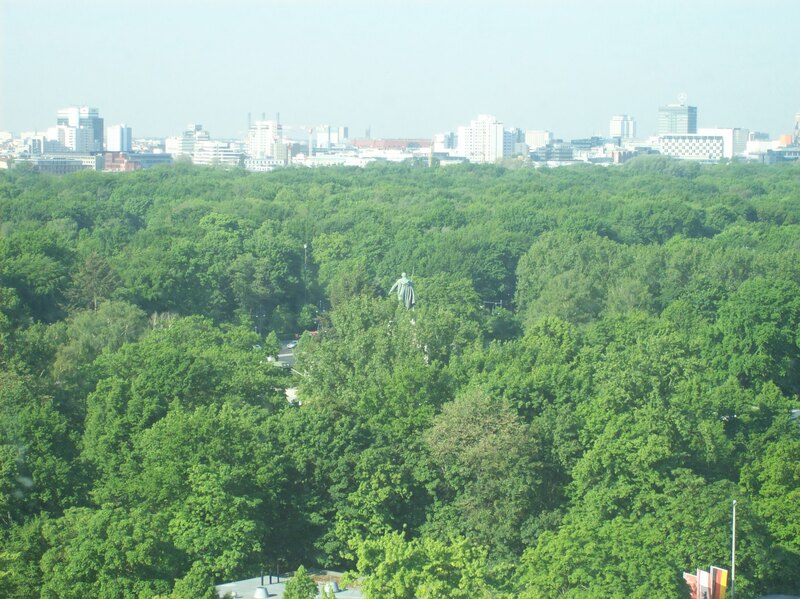 Now, it is just a parking lot surrounded by apartment buildings, because the German government doesn’t want any kind of memorial or acknowledgement there, for obvious reasons. There is a historical marker, kind of like the ones on streets in the U.S. but a little bigger and more thorough, in both German and English. After Fuhrerbunker we passed the site of Hitler’s pre-bunker home (once again, now built over) on the way to the bus stop. 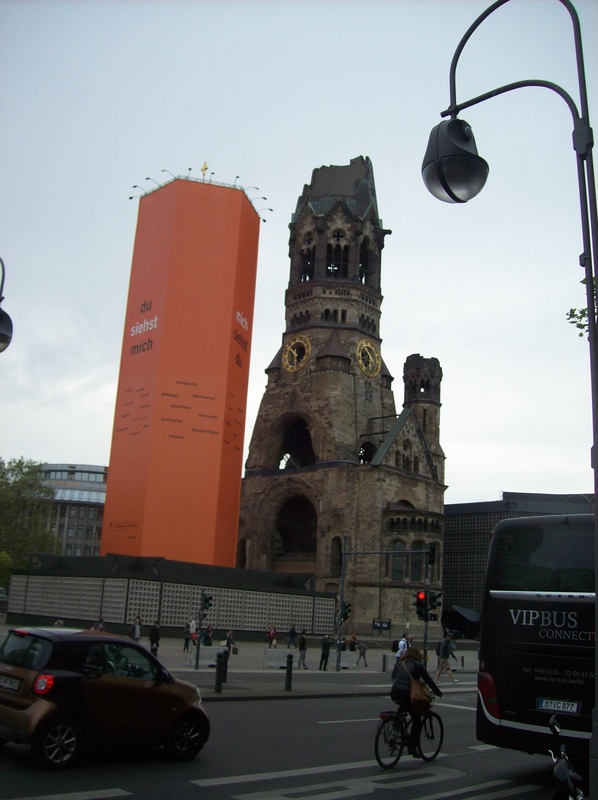 We rode to Kaiser Wilhelm Memorial Church, which was bombed in World War II and only partially restored. After dinner, we rode the bus (a double-decker) out to a more suburban part of town to walk thorugh a neighborhood and find Dietrich Bonhoeffer’s home. The streets here aren’t as busy as I expected, although it’s partially because many people use public transportation. As a result, train stations (the one at central city) look like shopping malls. The trams that ride the lanes of the street while attached to cables above are really cool. We spent this morning at “The Luther Effect” exhibit at a big museum downtown. The exhibit featured artifacts from the Reformation in Germany, and other parts of Europe, but also the “effect” of the Reformation and the Protestant Church in Sweden, Tanzania, South Korea, and the U.S. The U.S. portion included quotes from many well-known Americans, including Abraham Lincoln and Susan B. Anthony, on Protestantism. 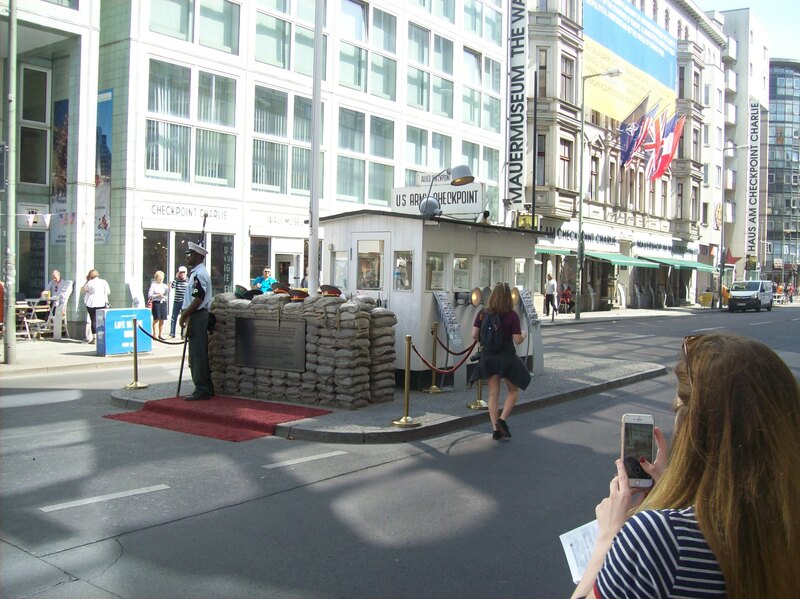 After lunch at the massive Mall of Berlin food court, we went to Checkpoint Charlie, the former gate/entryway between East Berlin and the American sector of West Berlin. 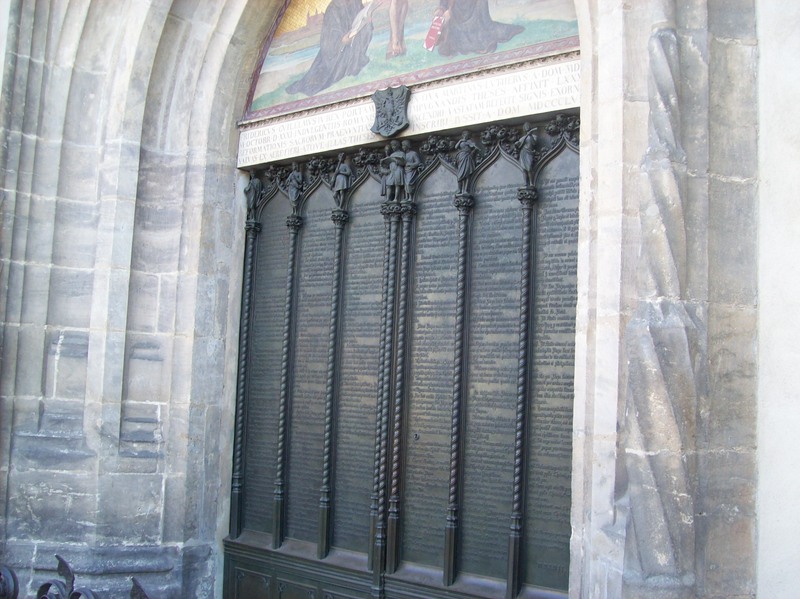 connection of Martin Luther’s anti-Semitic writing and his 450th birthday in 1933 to the rise of anti-Semitism in the Nazi regime. 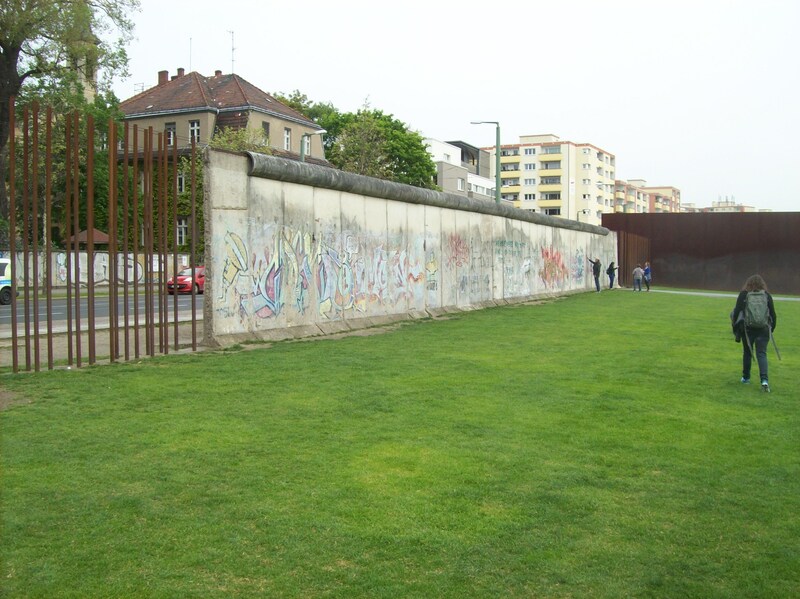 The location of the Topography of Terror also includes another still-standing portion of the Berlin Wall. I have never been to a city where the people are surrounded by history in their day-to-day lives like they are here. It seems at every turn there is a historical landmark, or that something happened in that location. 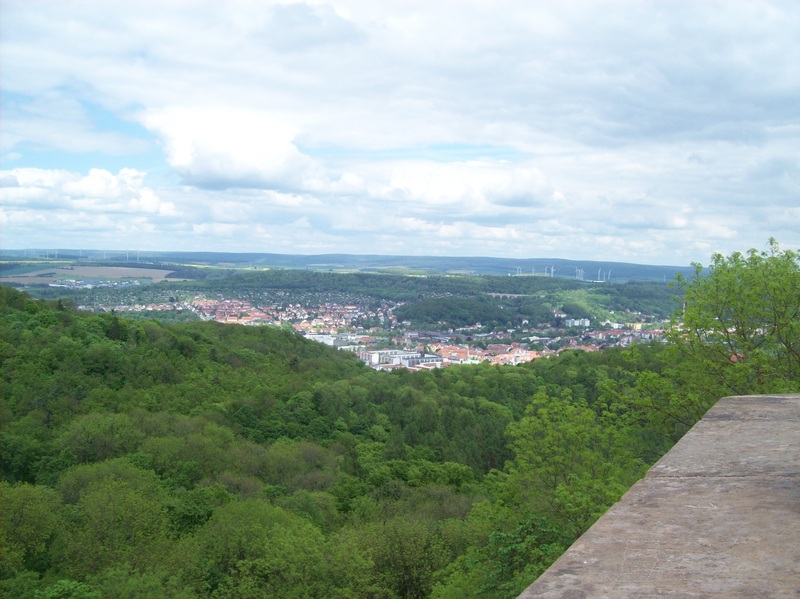 That said, I’m also looking forward to seeing small-town Germany (I can relate to it more) as we visit Wittenberg tomorrow (although it certainly also has many historical landmarks and events). Today we took a 45-minute train ride to Wittenberg, the home of Martin Luther for most of his adult life. Wittenberg is completely different from Berlin. 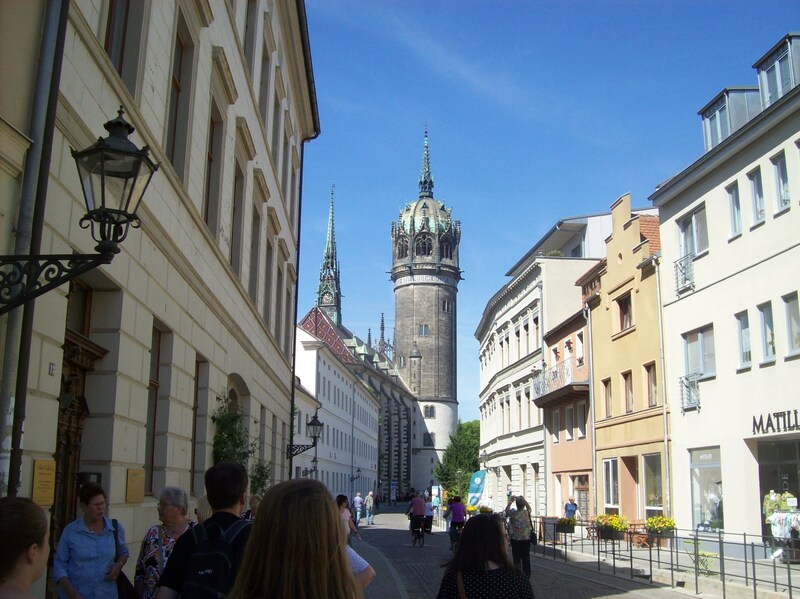 While Berlin has kind of felt like an American-style city with a European flavor, Wittenberg was a look into small-town and historic Germany. The streets in the downtown area are cobblestone and virtually everyone walks or rides a bike. We saw the Castle Church, where Luther posted the 95 Theses (1517) and is buried. The door (although not the actual door; it was burned down in the 18th century) is a great photo-op. We got a guided tour through town, by the City Church where Luther preached, the University of Wittenberg, and the homes of Luther, Phillip Melancthon (university professor and fellow reformer alongside Luther), and Lucas Cranach (artist and Luther’s friend who painted him many times). We toured the inside Lutherhaus and Melancthonhaus; Luther’s home included many of his writings and some printed Bibles, while Melancthon’s included the original Augsburg Confession. 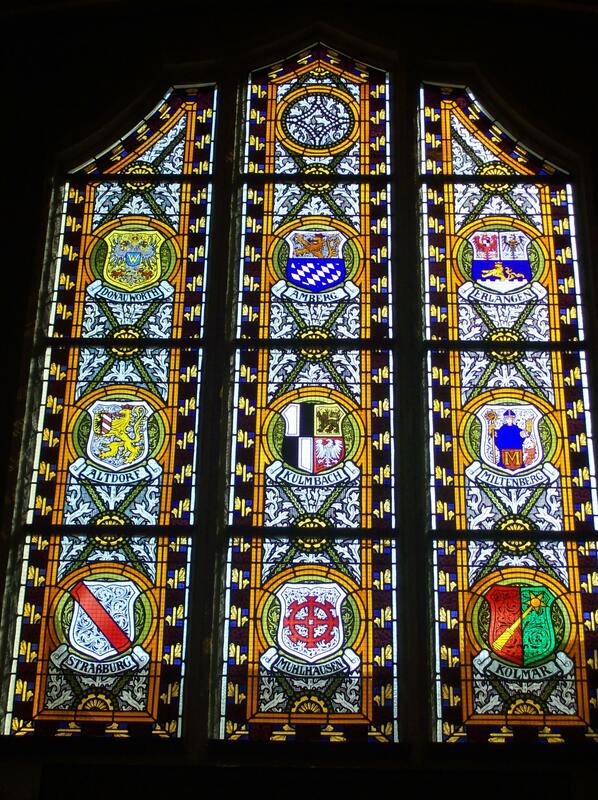 After the tour, we went back to Castle Church for an English-speaking service. 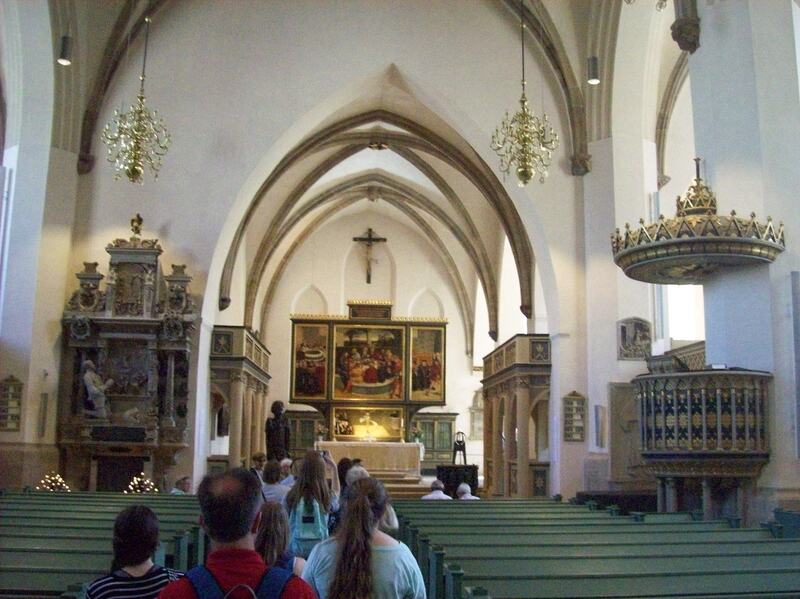 Afterwards, we looked at the altar area, which includes some incredible architecture and the grave marker for Luther. There was some discussion in the group as to whether that’s his literal gravesite or if it’s just somewhere on the church grounds. Between seeing the historic sites pertaining to Luther, and doing so in a charming small town like Wittenberg, this was probably my favorite day of the trip so far. Today began at a Starbucks, right in the shadow of the Brandenburg Gate. I’m not a coffee person, but Dr. Neal suggested to another student who doesn’t like coffee to try a mocha, so I had an iced mocha and liked it. It was an early morning, so I knew coffee would help with energy for the day. After breakfast, we went to the Reichstag Dome. This is the glass dome on top of the Reichstag (Germany’s Parliament building), which provides great views of the city in all directions. It also has an exhibit on the history of the Reichstag. We took an almost two-hour train ride to Erfurt at midday. The train rides in rural Germany provide a neat glimpse of the countryside. Many of the towns are very small and compact, and some are even just the area of two or three football fields in total. A lot of these don’t even have a train stop. 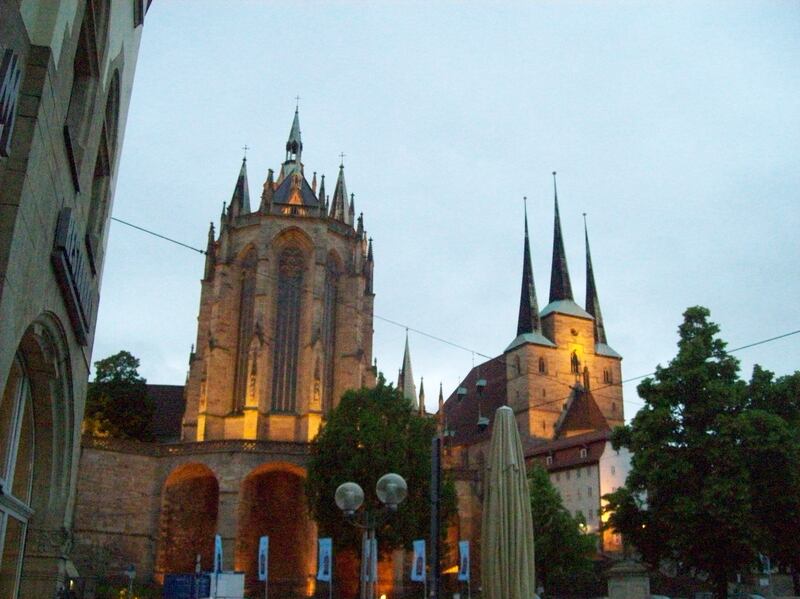 Erfurt is a larger, more modern version of Wittenberg in some ways. There are many churches here, all aesthetically pleasing. 200,000 live here, but it still has an intimate feel. This afternoon we toured the Augustinian Monastery. 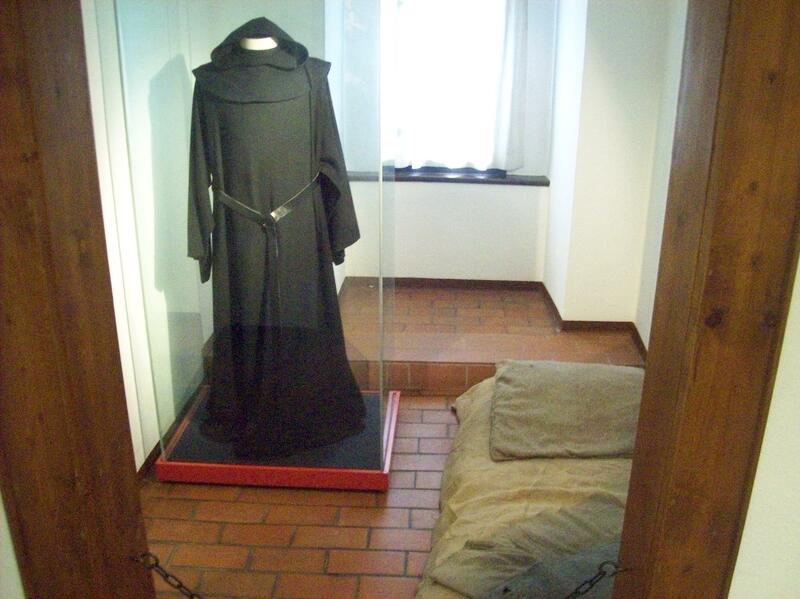 Luther lived there as a monk before moving to Wittenberg. Seeing and hearing about the lived led by the monks was very interesting, and I had been looking forward to this site after writing a paper on it. 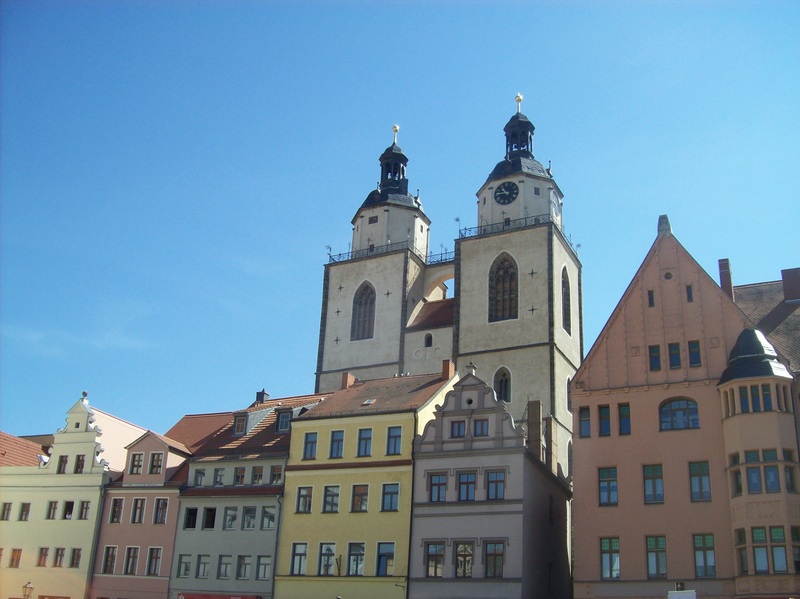 We continued through the tour through more of Erfurt, seeing old homes and churches, as well as the buildings where Luther studied at the University of Erfurt. It rained, with some thunder and lightning, through this part of the tour. 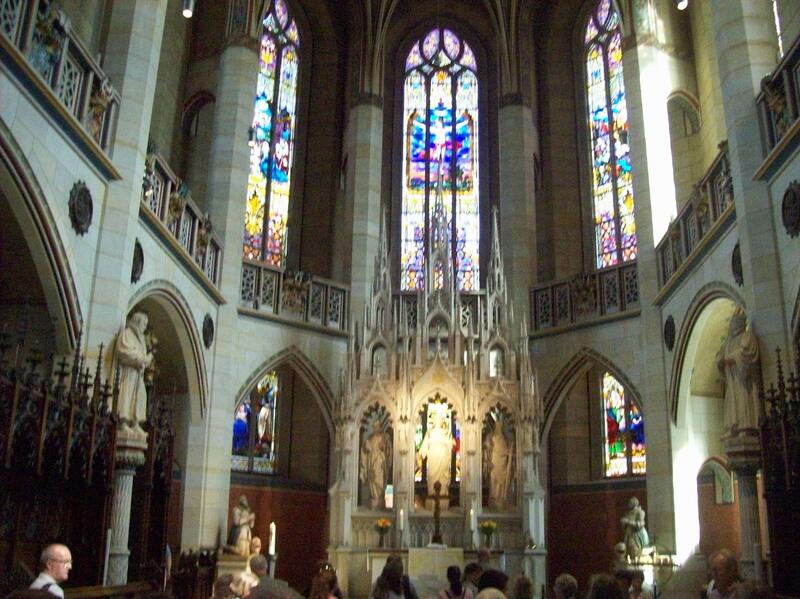 We ended at a massive and beautiful cathedral, where Luther was ordained. Today was a long and crazy day. We began with laundry in Erfurt, which was crazy in itself (picture 16 Americans in Europe at a laundromat). As a result of that, we missed our train to Eisenach, although we simply ate lunch in Erfurt and caught another train an hour later. 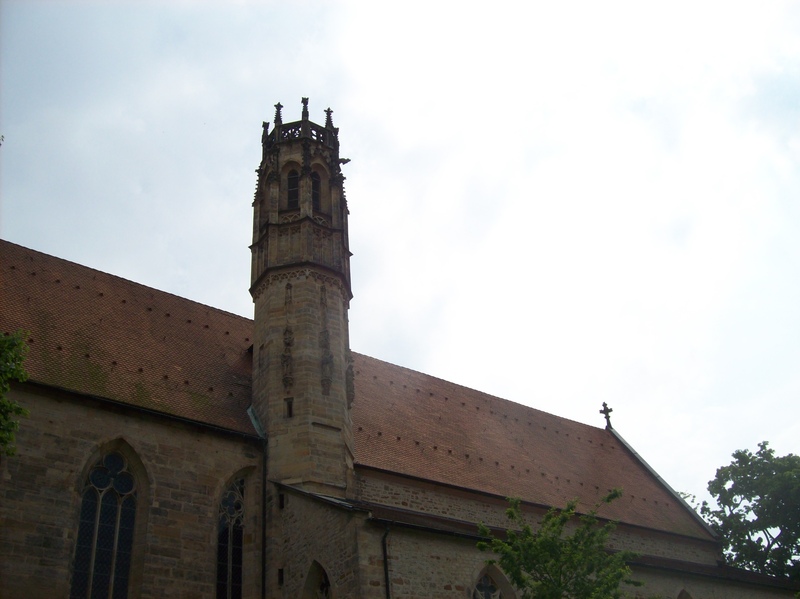 In Eisenach, the streets are cobblestones, all the buildings are old, and there are many old churches. 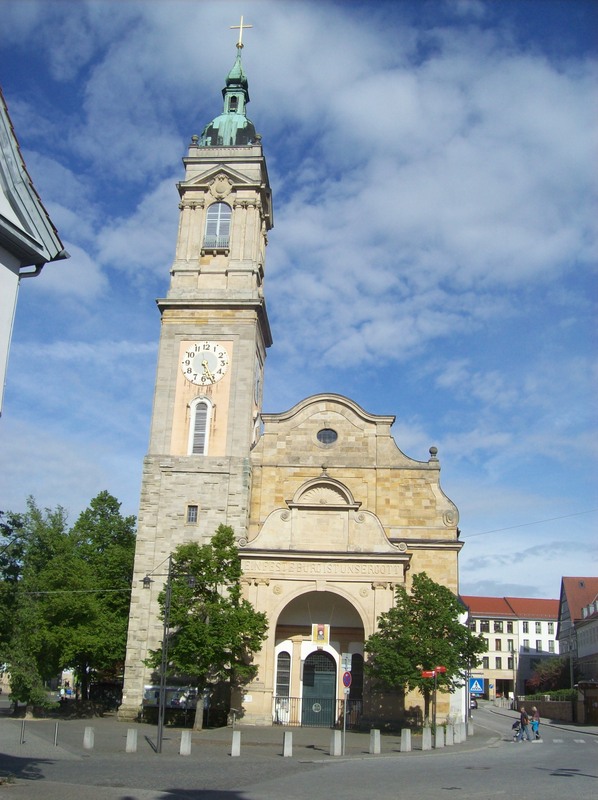 One of these is the church Johann Sebastian Bach attended, and Luther briefly did as well. 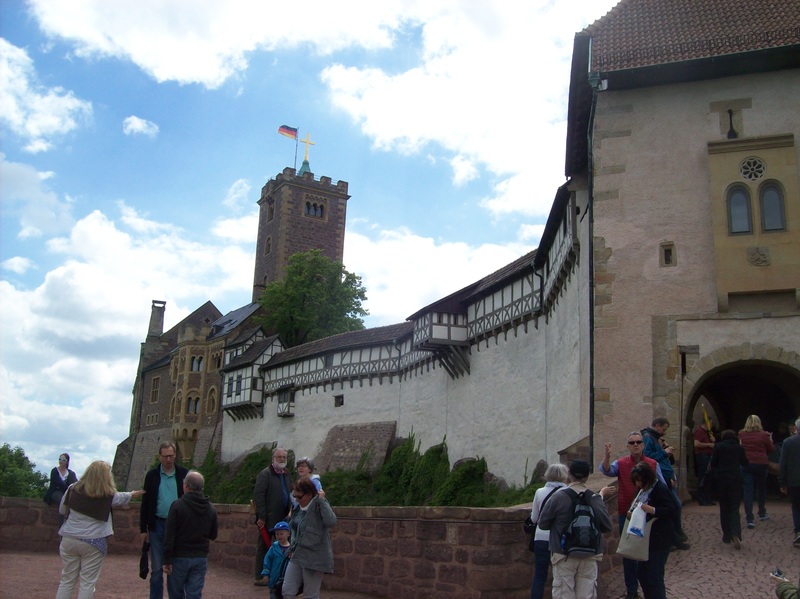 the castle is the third site of the national Luther exhibit for the 500th anniversary of the Reformation, after the two we saw in Berlin and Wittenberg. After hiking back down, dinner took a while but was quite interesting. It was a restaurant where everyone gets the same meal, cooked as if from the Reformation era, and served by waiters dressed like Luther. It started with bread, then beef soup, then some vegetables, then the main course of bratwurst and a meat and vegetable roast. Dessert was what I can only describe as “flaming fruit.” Due to the length of dinner we missed our original train, then had to run about a half-mile to make sure we caught one back to Erfurt. This morning we went from Erfurt to Mainz by train. On the ride, we passed through Frankfurt, and saw some distant mountains. Once we were in Mainz, we met with the chaplain from a Christian student group at the University of Mainz. He showed us their student housing building, and their church building where students meet to worship. From there, we visited the Gutenberg Museum. We saw demonstrations of how Gutenberg’s pages were printed, and saw some of the original Gutenberg bibles. The museum had a lot of stuff about various forms of printing, including the history of the newspaper, although many of the exhibits did not have English on the information plaques (most places throughout the trip have had German on the top or left and English on the bottom or right). The museum sells replicas of different pages of the Gutenberg bible—I got Genesis 1 and John 1—as well as replicas of the letters used in his movable type printing. From the museum, some of us went down the couple of blocks to the Rhine River for a few minutes, then walked back up to near the museum to Mainz Cathedral. This cathedral was, as many are here, quite beautiful. 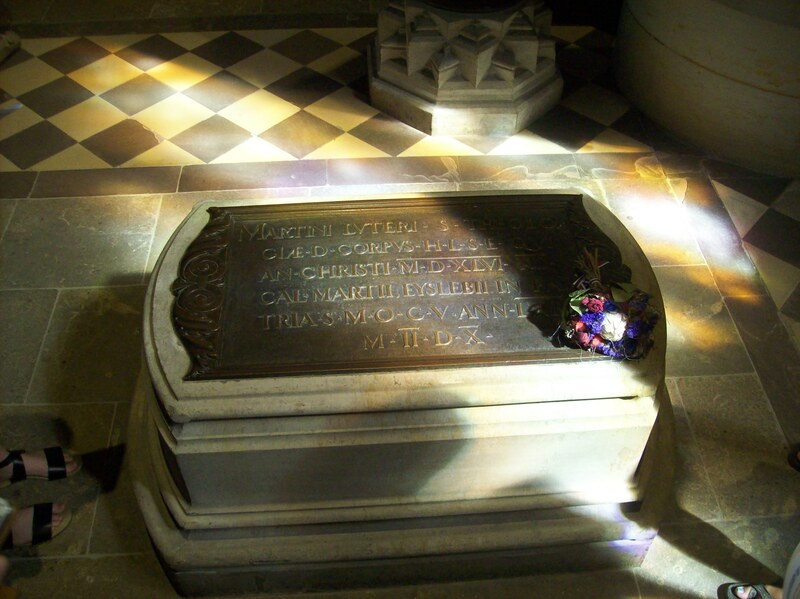 Many archbishops are buried there. Today was a day for Italian food in Germany—I had pizza for lunch (at a shop in the train station), and lasagna for dinner (at an Italian restaurant). Tonight is our last night in Germany, before we cross the Swiss border tomorrow. This morning, we rode a train to Worms for breakfast. After breakfast we walked a short distance to the location of Luther’s Diet of Worms speech—the building no longer stands in is a courtyard, although the church itself is still there (a Catholic church). 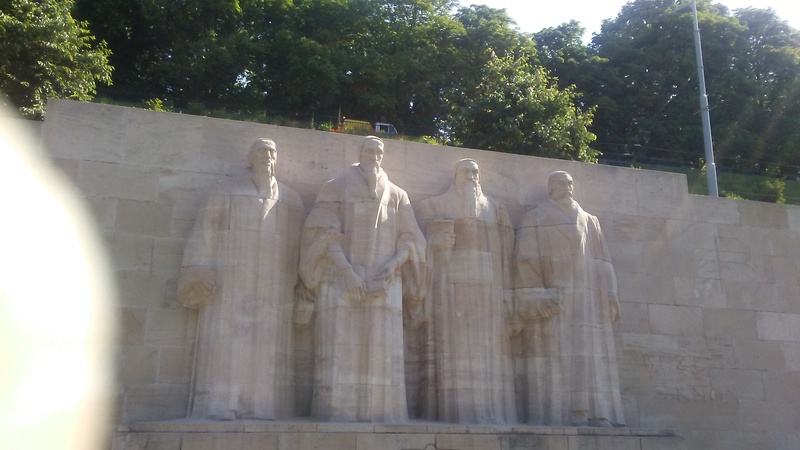 We also passed a beautiful and elaborate Reformation monument with statues of Luther, Melancthon and others. We got back on the train to go to Zurich, arriving mid-afternoon. 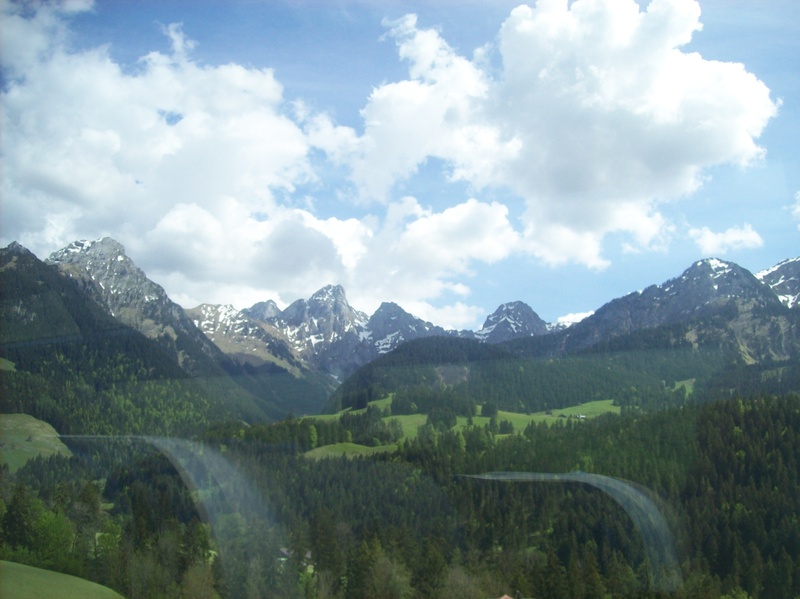 We rode through some low mountains, a nice prelude to tomorrow’s Alps trains. We crossed the Swiss border at Basel. Zurich is kind of a high-class city. Things are more expensive, and there are fashion stores and really nice cars around every corner. part of Switzerland at that time. The church is beautiful, as many of them are here. After touring the main part of the cathedral, as well as the crypt and a chapel and a pastor’s study, we got to go up a lot of stairs to one of the church’s two towers. The view from there of the city, Lake Zurich, and the Alps in the distance (with snow on the tops in May!) was amazing. We had a unique dinner at a cafeteria on the top floor of a department store, which Dr. Duncan said was because things are so expensive in Zurich. 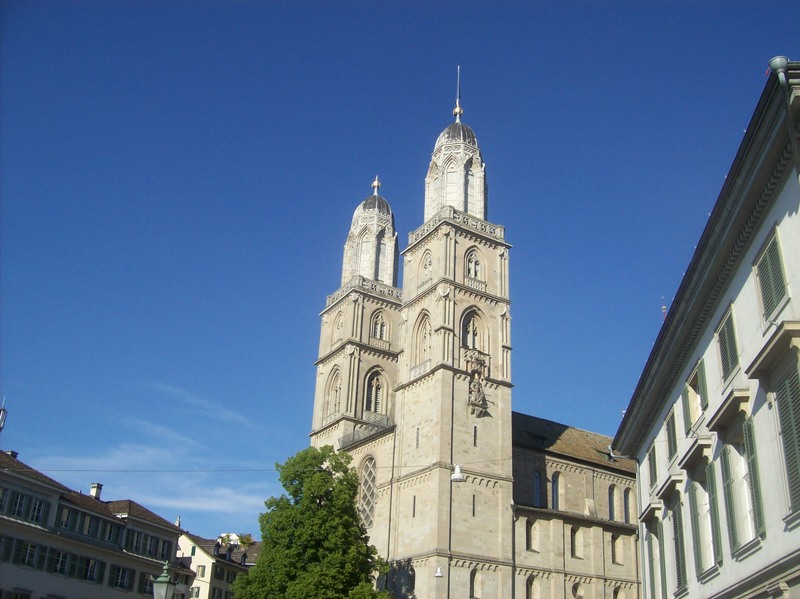 We walked back to the hotel down Bahnhafstrasse, one of the main streets of Zurich. I am writing this from our hotel balcony, which is adjacent to the back of a church, and has a partial view of the distant skyline. 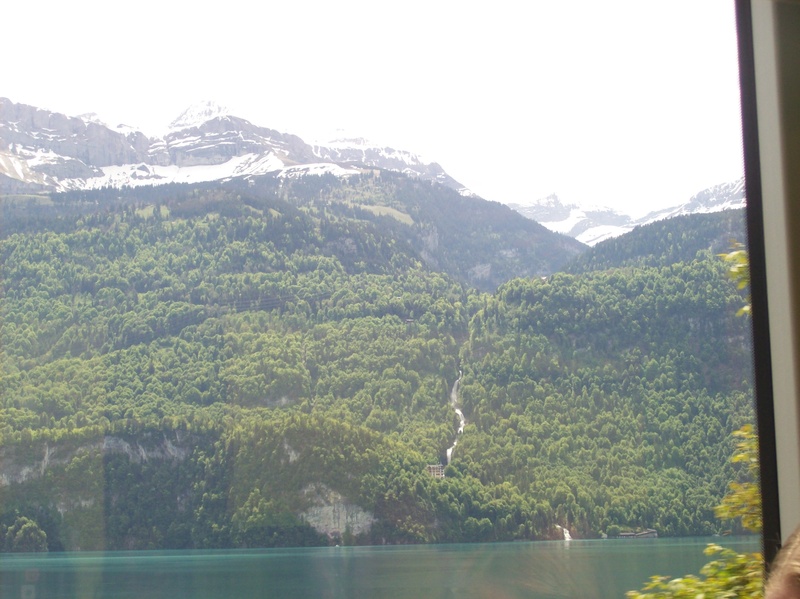 Today we traveled by train from Zurich to Geneva, passing through the Alps. This part of the world is so beautiful, and words don’t do it justice. The mountain tops had snow, even with the temperature at “ground level” above 70. These mountains are all very steep, and most are untouched at the top. The rivers and lakes in the valleys only added to the views we experienced. 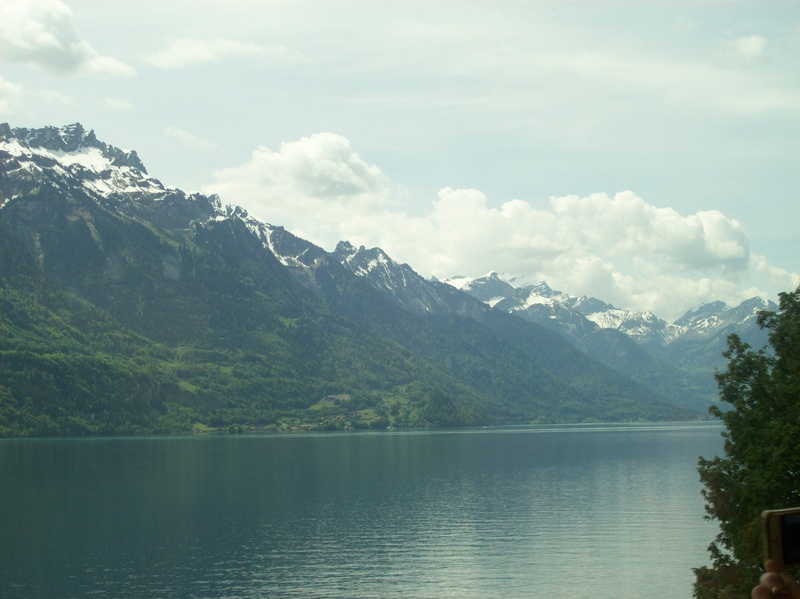 One of our stops was in Montreux, We walked down to the bank of Lake Geneva, with the Alps and the Swiss/French border looming across the lake. 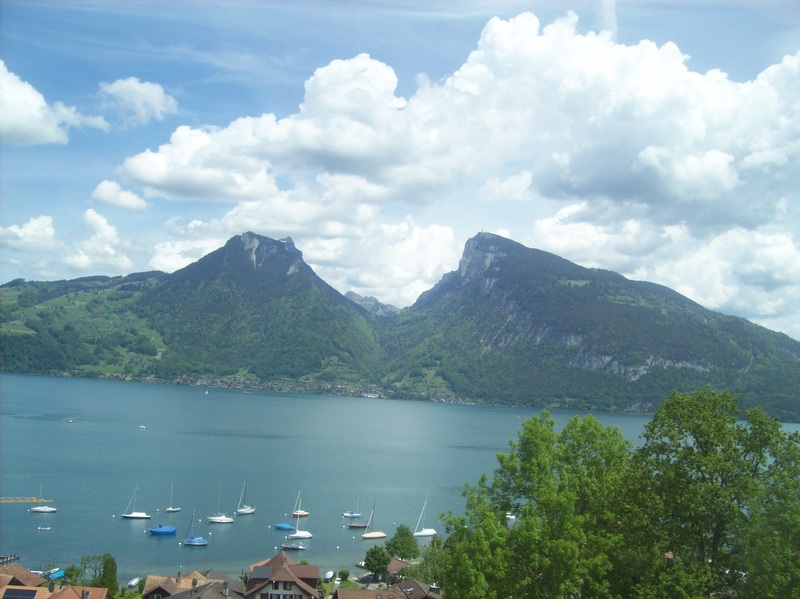 From there, our last train was from Montreux to Geneva, and was mainly along the lakeshore. Geneva itself is the busiest city we’ve been in on the trip, or at least it seems that way. Our hotel is tucked in the top few floors of a building, the rest of which is office space. I don’t know what New York feels like, but I imagine it to be kind of like this. After dinner, we walked by the (unlit) Reformation Wall, then by St. Pierre’s Cathedral. 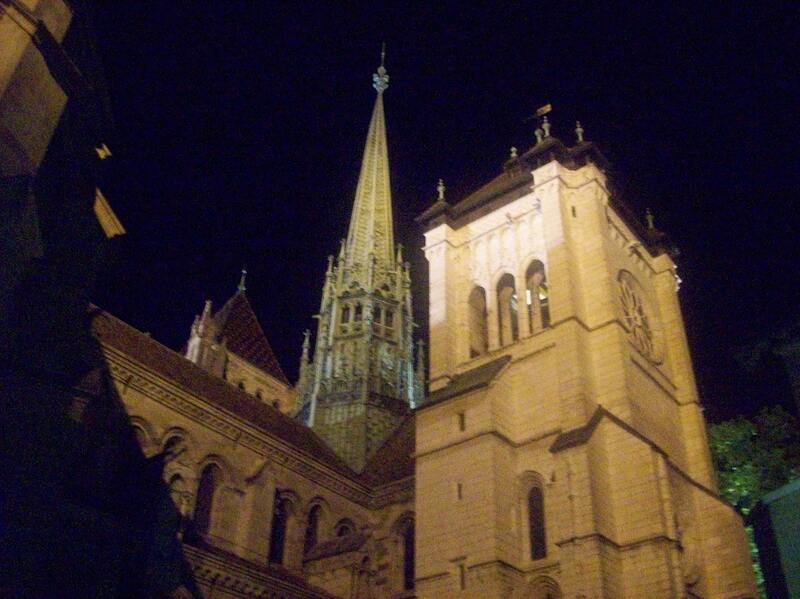 The church is beautiful at night, and we’ll tour the inside tomorrow. We began our first full day in Geneva with breakfast in our hotel rooms (croissant, wheat roll, orange juice, and hot chocolate). We then walked to the Reformation Wall, then to St. Pierre’s Cathedral. This church had someone playing the organ (it sounded like they were just practicing), and it made the atmosphere more authentic. We climbed to the top of the two towers and got great panoramic views of the city. From there, we split into smaller groups. 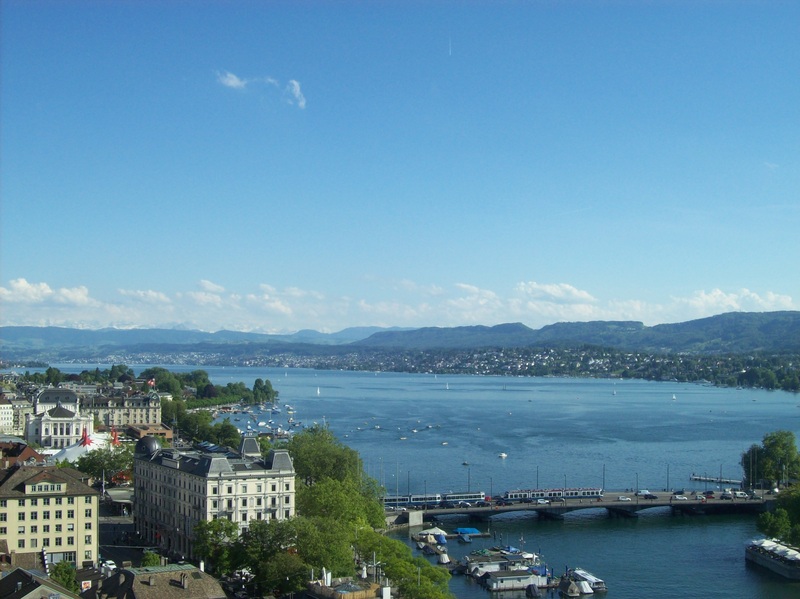 We have a “Geneva Pass” which gets us free entry into most of the landmarks and attractions. Three of us ate lunch at McDonald’s—I’d honestly wanted to see what American fast food was like over here—and I got a “cheeseburger royal,” which sounded different but was just a regular burger with some kind of extra sauce. We then walked to the Modern and Contemporary Art Museum (that was an experience—some very different and unique artwork). The whole group came back together for a lake cruise, which lasted about an hour. Our small group then stopped at Starbucks (iced mocha for me again) and Coop, a store that is a mix of a department store and supermarket, strung out over several floors of a city building, before eating dinner. Today was Ascension Day in the European Church, a holiday which marks the ascension of Christ on the 40th day after Easter. 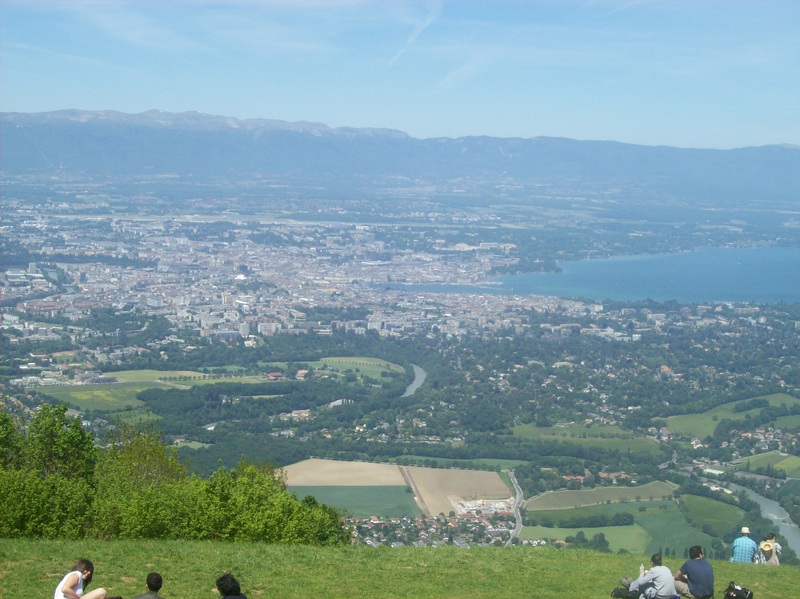 Because of the holiday, some of the tourist attractions in Geneva were closed. 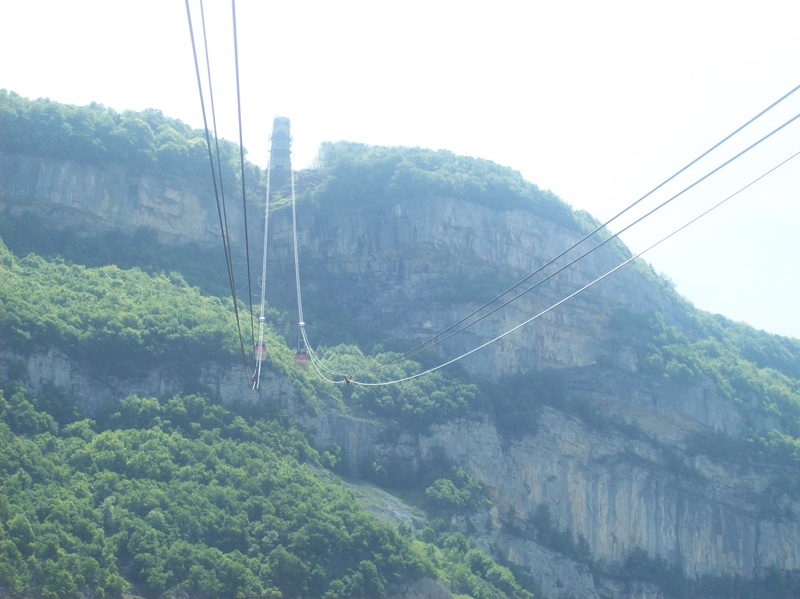 We did still get to go just over the border into France, just outside the city, and ride a cable car up Mont Saleve. 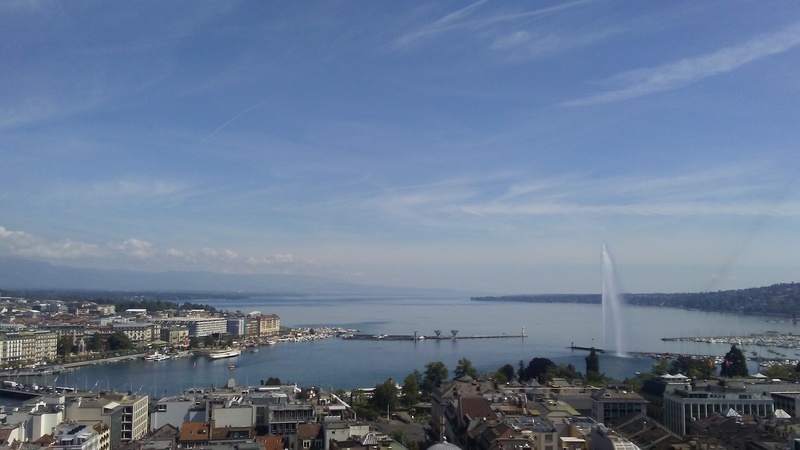 The cable car ride was less nerve-wracking than I thought it would be, and the view of the city and Lake Geneva, as well as the surrounding mountains, was amazing. We spent a couple ours at the top, eating lunch and walking around a small park that’s up there. Our final dinner was at a nice French restaurant near our hotel in Geneva. I ordered “beef tartare,” which I figured was some variation of beef with tartar sauce, or something like that–but my guess was lost in translation. When I got the dish, I was surprised to see it was barely-cooked beef, finely chopped and mixed with onion, pepper, and other seasonings, and spread over buttered bread. I typically don’t like “raw” meat, but this dish wasn’t bad, and was certainly unique. Tomorrow will be a long day—we fly Geneva to London to Atlanta, which is roughly 11 hours of combined flying. The flight home wasn’t as bad as I expected. On the Geneva to London flight, I had a window seat, which provided a great final view of the Alps and Lake Geneva, as well as a distant view of Paris. The second flight (London to Atlanta), I listened to music and watched some of the in-flight entertainment, and slept some. I’m writing this on Saturday afternoon, and I am so grateful we flew back yesterday and not today, because British Airways has had a massive IT failure and all flights in London are cancelled. I’m glad to be home, because I’m excited about sharing my experiences with everyone. But I do already miss the experience of being in and exploring new places, seeing things I haven’t seen before, trying different food, and learning about the culture and history of another place. Traveling abroad is such a fulfilling experience, which I would recommend to anyone and everyone. This was my first foreign trip, but certainly won’t be my last.